In common law, there is no implied term in a lease … . Cf. constructive condition. See also agent, caveat emptor, fit for the purpose, implied warranty, negligence, notice. E.H. Rabin et al. Fundamentals of Modern Property Law (4th ed. New York: 2000), Assignment 1, ‘Implied Landlord’s Duties and Tenant’s Obligations’. 1 Williston on Contracts (4th ed. St. Paul, MN: ©1990- ), § 1:6 ‘Implied Terms in Contract Law’. 12 Williston on Contracts (4th ed. St. Paul, MN: ©1990- ), Ch. 34 ‘Usage and Custom’. Paterson et al. Contract: Cases and Materials (11th ed. Pyrmont, NSW: 2009), Part V ‘Gap Filling – Implied Terms in contract law’. Hudson’s Building and Engineering Contracts (11th ed. London: 1995), §§ 3-179—3-199. Odgers’ Construction of Deeds and Statutes (5th ed. London: 1981), pp. 113–118. H.G. Beale et al. Contract Cases & Materials (5th ed. Oxford: 2008), Ch. 15 ‘Implied Terms in contract law’. Chitty on Contracts (29th ed. London: 2006), Ch. 13 ‘Implied Terms’. M.P. Furmston. 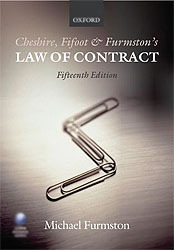 Cheshire, Fifoot & Furmston’s Law of Contract (15th ed. Oxford: 2007), pp. 172–91. L. Koffman & E. McDonald. The Law of Contract (5th ed. Oxford: 2004) Ch. 7 ‘Express and implied terms in contract law’. K. Lewison. Interpretation of Contracts (4th ed. London: 2007), Ch. 6 ‘Implied Terms in contract law’. G.H. Treitel. The Law of Contract (11th ed. London: 2003), pp. 201–214. 4(2) Halsbury’s Laws of England, Building Contracts, Architects, Engineers and Surveyors (4th ed. Reissue), § 334. 13 Halsbury’s Laws of England, Interpretation of Deeds and Non-Testamentary Instruments (4th ed. Reissue), §§ 180.